Notaro Chiropractic attended the annual Twin Cities Expo in March 2017 at North Tonawanda High School. Dr. Megan Lafave, Massage Therapist Alana Lentini and Asst. 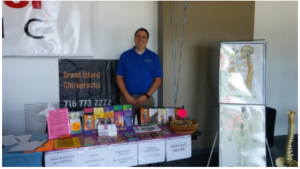 Office Manager, Jen Paonessa were there offering complementary massages, spinal screenings and educating the community on the benefits of Chiropractic.